The Everest spring season is fully underway, at least on the Nepal side of the Hill. Multiple teams are trekking to Everest Base Camp – Nepal aka EBC. One team has already arrived at EBC. Meanwhile, there are only a few teams on their way to the Tibet side, more to begin this week. Each weekend during the season I’ll post a “Weekend Update” summarizing the main stories for the past week. The biggest news this past week was that the Icefall Doctors have finished putting the route in from EBC to Camp 2 in the Western Cwm. This is right on schedule as I’ll discuss later. Today has brought a change in weather. Namche was in the cloud this morning, but lifted above the village as we set out. However by the time we reached the top of the terraced streets, rain and hail began to fall. Most of the trekkers took shelter under shop fronts or trees, as we put our goretex on and carried on. Colourful umbrellas dotted the path ahead as we traversed along the hill. 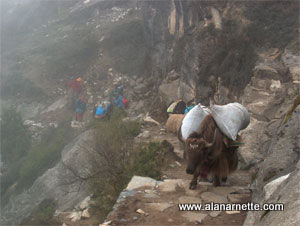 Rain and hail turned into snow as we cut off the main Everest Base Camp trail towards Phortse. At times no one else was visible as the snow thickened. We gained height and reached our high point for the day at Mong, as it appeared out of the snow without warning. It’s snowing! Glad I checked the forecast and decided to cross the Renjo La 2 days earlier than my anticipated schedule. The conditions today couldn’t be much more different from yesterday’s glorious weather. Today will be mostly spent drinking coffee and eating cake. Sure enough the construction at the Kathmandu airport stopped most flights from Kathmandu to Lukla forcing teams to either take helicopters, which most did, or make the five hour extremely bumpy drive to Manthali Airport in the Ramechhap Provence for a 20 a minute flight. Some lucky teams did manage to get a fixed wing flight out. I say lucky because it was faster and less expensive than the other two alternatives. There are mixed messages out there about the “closure” but the essence is you can still fly to Lukla but only after 8:00 am. Add in the 30 minute flight plus airplane taxi time, etc. the flight lands about the same time the clouds usually begin to develop over Lukla. As I covered earlier this week, there are no instruments or radar at Lukla so the pilots depend on visual rules and that’s too dangerous with low clouds. All this said, there are days when the weather is perfect so its a gamble. EverestER is building their camp at EBC and getting ready for another season. Several helicopter landing pads have been built at EBC to support the expected heavy traffic of flying people in and out of base camp for a variety of reason, including their “vacation” to a 5 Star hotel in Kathmandu before their summit bid. In 2015 the Ministry of Tourism put a policy in place of “Helicopters barred to go to base camp except for medical evacuations.” Of course with the corruption in Nepal, this was never enforced. And finally, the rhododendrons and magnolia trees are in full bloom! Every year, we hear that the “The route through the Icefall is in early. This may mean the teams can get an early summit.” Well, I took a look over the past 10 years to see what the data shows and there is no connection between the dates. In other words, the route can be in as early as April 2 and the first summits are still well into May. The first summits are almost always by the rope fixing team, but not always! I also made an estimate of the number of ladder crossings in the Icefall (not the number of ladders used) and it was remarkably consistent with around 20 crossings with the number getting lower over time. Bottom line is we can expect to see the route through the Khumbu Icefall in during the first week of April and the first summits about a month later. Teams will continue to arrive at EBC and some to Chinese Base Camp aka CBC on the Tibet side. Now that the route is into Camp 2, Sherpas will begin to ferry supplies to build Camp 1 and Camp 2 in the Western Cwm. Of course, there will be an ever mindful eye for serac releases off the West Shoulder of Everest similar to what occurred in 2014. Also, several teams are climbing Lobuche East, around 20,000-feet to eliminate one rotation through the Icefall. Several times a day, I’m updating the team location table and tracking climber’s blogs (see sidebar). If you have a team not listed, please let me know and I will add them if I can track them. If you prefer not to be mentioned, please contact me. You can sign up for (and cancel) notifications on the lower right sidebar or check the site frequently.